Do you work for Drupal? Learning about Drupal? We can help. "Flexible and powerful web development tool"
Drupal is a really robust web development platform with lots of tools. I like that Drupal propose a lot of different modules like video, membership, commerce. Thanks to them you may add new features to your website. What is important, each module has submodules, which help to add only those blocks which you need. The best thing is that you may combine different functions from different modules. I don't quite like that the Drupal admin panel has an older looking design. Everything is too sharp and without much color. When we started using it, Drupal did not seem to be very intuitive, but I got used to it quickly. I also dislike that there are no simple visual builders. It still takes a bit of time to create a new layout. I would recommend Drupal to those that are willing to do some learning and having an interest in web design beyond simple DIY tools. It is a reliable and flexible platform. The level of security is pretty high. The most important thing is that Drupal will help you to create a professional website without overly complicated steps, unless you want to introduce more advanced custom features. The Drupal platform has given me a good balance between a complex and simple web development platform. Though there are many modules and features that allow me to create robust and well-structured websites simply, it also leaves much room for coding and more advanced development and rich website design and functionality. The available templates also make starting on designs much easier. "A solid CMS with just a few hangups"
The ability to build custom modules that are usable by the whole team, regardless of dev experience. Drupal also has a very large array of pre-built modules for all purposes and is constantly expanding. It is very difficult for content editors to also edit HTML or code. That is very much limited to developer roles, and it's hard to have any crossover. Consider the needs and resources of your business. Effective implementation of Drupal requires full-time, or at least always-available dev support even for small businesses. Larger sites (50+ pages) may want multiple developers available to keep up to speed with updates, security and changes to your website. 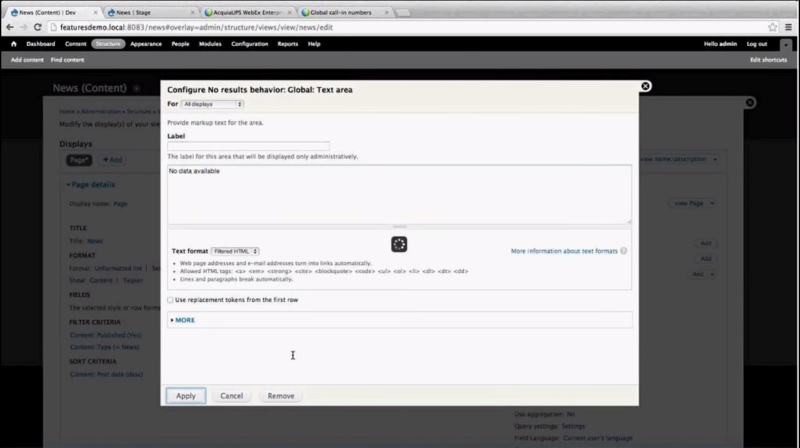 Permissions for large teams also take a fully dedicated web admin. In summary, it's not as agile as newer, marketing-focused solutions such as Hubspot CMS, but it is very powerful and has a strong history. An easily editable, maintainable website with a high number of pages and users. "Versatile open source CMS for Large sites." Drupal is great for very large sites, when you want to display content from the same source, but shown many different ways, with active updating, and even on the fly page creation in response to a query or changing requirements, so that you don't have to manually re-edit content at the individual page level. YOu can edit in the original content page, and then it is automatically shown all the places it appears. It's relatively easy to administer for someone with previous CMS experience, especially with versions 7 and 8. It can be a very long time between major upgrades, and installing them is not a simple matter. Even small security updates are a big deal, and the site has to be backed up and shut down. Drupal is excellent for large or complex websites, but it you have only basic web design or HTML experience, or haven't used a CMS before, I recommend hiring a professional team to design your first site for you and show you how to administer it. Once it's up and running it's not hard to update and maintain at all. We don't have a large staff, but we do have a large website, with a lot of information in different places. Drupal makes it easy for us to enter updates or new content, and have it appear correctly updated everywhere it is is supposed to appear. "Powerful CMS for techies, but not for regular web designers"
It is very powerful and flexible, and you can do a lot of customization to meet your needs. It has a large community who can provide all the help you need. There are many pre-built applications in Drupal, called distributions, so if you can download and install the distribution with all needed plugins and template, and you are ready to go. The learning curve is high and sometimes it requires you to know a lot about programming to achieve what you need to. The Drupal core developers don't seem to care about how to make the UI easier to use from the end user's perspective, but to focus on the functionalities. As a result, user has to spend lots of time to figure out how things are working in Drupal. You need a dedicated personnel who knows programming in PHP to be able to maintain the website built in Drupal. I was trying to build a website for a small business and the business wanted to have a membership feature in their company's website. Drupal can handle users and roles easily so my client limit access to protected documents based on their roles without needing to use a third-party plugin. The plugin and template directory is not maintained well so there are many plugins and templates are outdated and it could be very confusing for a new Drupal user to choose the right plugin and template. "CMS versátil y potente con la mejor comunidad de usuarios que existe"
Con Drupal puedes hacer de todo, webs corporativas, plataformas de comercio electrónico, personalizaciones, sitios de redes sociales, boletines informativos, directorios de recursos y mucho más, es complicado no encontrar solución a lo que necesites. Es el sistema más seguro del mercado. 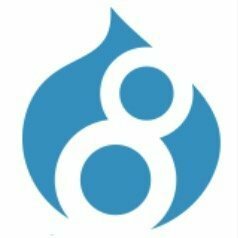 Drupal también tiene muy buenas opciones de internacionalización. Puedes administrar contenido en 4 idiomas diferentes y todo está integrado a la perfección en un solo lugar. Desde la perspectiva de SEO, Drupal funciona a la perfección, desde el tiempo de carga hasta la capacidad de rastreo. Si bien Drupal puede facilitar las cosas difíciles, también tiende a dificultar las cosas fáciles. Los módulos de Drupal proporcionados por la comunidad a menudo te ofrecen casi todo lo que necesitas, pero para que tu proyecto funcione exactamente como necesitas, tienes que crear módulos personalizados o parches por ti mismo. Muy recomendado para empresas medianas y grandes, pero siempre con un buen proveedor de hosting que sea totalmente compatible con Drupal. Personalmente prefiero Drupal a cualquier otro CMS pero definitivamente tiene una curva de aprendizaje importante. Si vienes de otro CMS como Wordpress, por ejemplo, te costará adaptarte. Creo que vale la pena una vez que te sientas cómodo con el cambio. Drupal proporciona una forma de crear grandes sistemas de información y multiusuario sin tener que implementar funcionalidades genéricas de gestión de usuarios o gestión de contenido, entre otras. También proporciona interfaces bien definidas entre módulos que aseguran que la mayoría de los módulos desarrollados por la comunidad funcionarán con otros módulos que usemos o escribamos desde cero. Drupal proporciona puntos de extensión que permiten ampliar o modificar lo que hacemos a medida que nuestra base de usuarios crece. "Intuitive to Use, But Needs More Ongoing Support than Expected"
Its open source meaning its widely supported by the public. There are many modules providing lots of additional functionality and its a very easy CMS took to use. If you're looking for a free CMS which is easy to use and well supported within the user community , Drupal is for you. However with its very regular updates in terms of the Drupal framework and modules you will need to invest sufficient time to test any upgrades out before deploying into your production environment. Utilising the Drupal framework allows a quick and easy way to begin building websites for my clients, which vary from small to medium sized businesses. It means that whilst I personally have an understanding of HTML, the use of this CMS, means to get a site up and running this understanding is not required. "Flexible CMS for a website/app of any size"
There honestly aren't many things that we can complain about. It is open source and comes with a large community of help. We would high recommend giving it a second look when considering a CMS for your website! Clients come to us with ugly websites that their IT department alone can manage. Building Drupal sites gives our clients a robust CMS that they can easily maintain and manage on their own. We perform updates periodically, but for the most part can remain pretty hands off if the client wants to run with their new site. Additionally, we have the ability to create virtually anything that our clients as in terms of functionality. This makes us look like rockstars and our clients thrilled with their site/app. "Complex CMS but highly extensible"
Drupal is great for building and managing websites that require custom content types and workflows. It provides built-in, GUI-based, functionality for creating content types, workflow rules, and other custom content management requirements. Drupal has has a strong built-in user management system. It's more of a framework of GUI-based tools that allow you to more quickly extend it for your requirements. Drupal also offers a well-developed API for extending the system. It's add-on ecosystem is also better managed then some other CMS. Powerful command line tools are also available to make operational management tasks (such as upgrades, sync'ing from dev to production, etc) much easier. The Views module is exceptionally useful for knitting together tables of data that draw on the fields on distinct content types. Some of it's management features are not as slick on the front-end as WordPress. For example, upgrading modules is most easily done using command line tools. There is a steeper learning curve if you've never worked with it before. It really is more of a blend between a framework with API's and CMS. It's critical to understand your requirements first and determine whether to invest the development resources to implement a Drupal site. I highly recommend using Pantheon of Acquia to spin up a free dev site to learn about Drupal. We were able to build several websites that utilize many custom content types (content that have many unique fields within the type). It's extensible nature allowed us to easily integrate with third-party, hosted systems and pull/push data to those systems. "Drupal Help Build An Engaged Community"
For some things, Drupal is incredibly fast and simple to use. I can post an event to our website, or make an edit in minutes. The resulting website is also incredibly polished and professional looking. It is also useful as a very large institution incorporate multiple independent entities that are quite large in and of themselves, to be able to display a simultaneously unified and diversified appearance between their individual sites, but also to share a common system with common features, to allow for instances of collaboration. If you come in to a website that has been created by someone else, or worse by several individuals over the course of years, it can be next to impossible to find some things. There are multiple ways to create a page, and depending upon which method they used, that particular section of text that you want to edit could be buried in any number of locations. Some of these locations are in and of themselves buried within a labyrinthine interface. Some pieces of content actually exist and must be edited in multiple locations. We struggle in particular with a lack of archiving ability on certain features, so we must leave it on the site indefinitely or delete it and lose the record. Drupal's interface, and text editor in particular, is also limited in terms of content styling - I had to use html just to change the font color of a phrase. We actually needed to employ third party development assistance just to add an additional social media icon - this was not something our communications team was able to use the admin interface alone to add. Finally, Drupal struggles with a lot of different file formats, as far as uploading is concerned. We rely on our website to get our work out to new audiences, and keep our current audiences engaged in what we do. Drupal makes the pathway for your most regularly posted pieces of content, like events and stories, readily accessible to allow for a constant and steady stream of updates, ensuring the full range of our activity is highly visible and our site is always current and up to the minute. "Provides a large number of modules and plugins that extends the functionality of your website." - Search Engine Optimisation is of utmost importance for the health of your site. If your website doesn't achieve well in terms of page rankings and search results, your online presence will suffer badly. Speaking from personal experience, Drupal does perfectly as long as you follow SEO Norms. Moreover, you are offered SEO tools. - Security is vital for anything on the Internet. Drupal has over the years earn a reputation for its secure and powerful performance while it has had its own share of issues like numerous SQL injection vulnerabilities. The community has been quick to respond to the problems, and for most of the time, Drupal has fared well in terms of security. - Drupal provides a large number of modules, themes and plugins that you can use to extend the functionality of your website. The software enables you to customize your site and make it meet your needs. The learning curve is steep, and it requires some efforts to understand, how the program works. Also, customization isn't the most straightforward process. Installation of an additional number of plugins can cause Drupal to slow down. Drupal is excellent for large or complex websites, but if you haven't used Content Management Systems before and know only the basics of web development, you won't manage the tool. The software enabled me to build large and complex web pages from "Lego Bricks" instead of writing lines of code. The modules allowed me to save a lot of the time. The versatility is the best. From small, single-page blogs to e-shops to complex portals - Drupal can do it all. As an editor, I value how many options it gives me to present the content I want to share and if I have an authorization, the easiness of adding new options. And, as most of the open source solutions, you are responsible for updating your software. The company that develops the platform can make some amendments to make it safer, but It's your responsibility to install all of the patches. Most of our problems and problems of our business partners are solved with Drupal. We developed our own webpage od Rupal and it is our best advertisement. Instead of writing countless lines of code, e can build complex web pages like from Lego bricks - ready modules spare a lot of the time and prevent reinventing the wheel, again and again. "Over complicated CMS with very little flexibility"
The system has poor online support. You will need a full stack developer to administrate and manage the code and updates. You need multiple plugins to get simple functionality to work. The updates of the core are also a minefield and you have to be very careful when upgrading. Drupal solved a problem I had where I wanted to combine a search based on multiple filters and then outputting the information into a lightbox. I also need a smart way to manage the company information in the backend. One really good function I was able to do is work with Affiliate links, I was able to pull in 30 to 40 feeds and upto 15000 lines of data every 15 minutes and convert them to posts to form a sports news website. "Robust Open Source That is Ready When You Are"
The Drupal developer community is really what makes Drupal the CMS it is today. If there is a business need or problem chances are the Drupal community already tackled it in multiple variations. Businesses and organizations just need to ask them selves if they are ready to invest in Drupal and if the answer is yes, then the choice is pretty clear. Drupal is a robust and well thought out and fast moving CMS, expect rapid change and updates and plan for it. The CLI tool called Drush is an industry best which no organization should do without. Remarkable performance can be achieved when the correct hosting is realized. Themeing a Drupal site is a joy when the right base theme is created or selected. The end result of a finished product is a website/product and backing CMS that will run near flawlessly for years on end. The learning curve for developers (arrays of doom) and end users is a bit jagged, but not impossible, at it's core Drupal is remarkably simple and powerful. Versions 6 and 7 are stable beyond expectation, version 8 is rapidly becoming the way forward, but still needs some major work in certain areas (media module). Organizations do have an up front development cost which might be too steep and without in house expertise in one area or another it may look like the least likely of candidates for CMS selection. Be ready to make significant investment in staffing hours to support Drupal or select from one of the many 3rd party development/hosting/support vendors that are widely available . Establishing web presence and expanding and extending enterprise level services to the public. "A complete CMS platform with lots of options"
I like that Drupal gives me control over many of the design and layout aspects of my website. There are many themes from the Drupal community I can use to get websites or landing pages up and running, or at least started, very quickly. The control panel has options to let me update content dynamically, which can then appear on all relevant pages and sections in real time. I like being able to update nodes once rather then manually updating content across many pages. There are many tutorials and community discussions to help guide me through many of the common steps and problems that may occur. Compared to other CMS platforms like WordPress, I find Drupal to be much more complex and harder to understand. I think it takes a decent amount of technical knowledge to be able to implement and modify a Drupal install successfully. Some of the common themes are rather poorly designed and virtually useless for professional business purposes. I would definitely recommend Drupal as CMS platform that can give you a good amount of control over the design of your web assets. If you don't have much time to committ to learning about the system, you should start with a theme and go from there. Drupal gives me a high amount of control over the web assets I design with it. It allows me to update content and page styles dynamically so I can get a fresh version up and running with limited delay. The cost of running Drupal is generally very low, which is great for our overall marketing budget. The Drupal community gives us creative ideas on how to leverage the platform for various business purposes we didn't consider before. "Great way to add features to your website"
It provides a way for someone to easily make updates to a site without knowing HTML. Someone can create a basic site in Drupal for someone else, and that person only needs to click "edit" to make instant changes to any page. It also allows for vast customization of a website, including almost any feature you can think of just by installing a module. It can take a while to learn. Someone who already knows HTML, and/or is comfortable with new technology should not have a problem. But tech novices may find it too difficult. You also need to plan for regularly updating the software, as there are frequent security patches in Drupal that need to be installed. When using Drupal, be prepared to spend quite a bit of time learning how it works, and playing around with the features. You have to think of Drupal more in terms of a database, made up of individual pieces of content called "nodes," rather than in terms of a static site made up of individual pages. You'll also need to complete several setup tasks at the beginning, such as choosing a theme (or downloading/installing a different theme), filling in the site title/slogan/logo, and deciding what features and modules are important for the site to have. Drupal gave us the ability to incorporate extra features into our site, including a blog and an event calendar. It also allowed us to have a nice-looking site without having to have a professional designer. 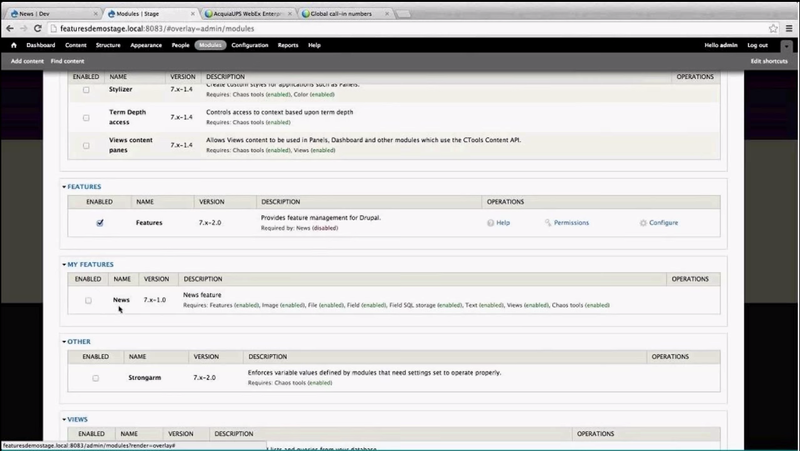 "Drupal allows you to build websites and manage their administration and content in them." * It can be adapted to different projects in a personalized, flexible and powerful way. * Its installation and configuration are very simple, especially for users or expert developers. * It is scalable regardless of the number of users connected to its products. * It has included functions of multiple languages, unlike other similar tools. * It is not very "friendly" for novice users, especially in its configuration. * It has very few free plugins, so it can generate some problems or delays in the updates of the websites produced. * Low user community or not as big as you might think. * Few themes of graphic or multimedia origin. It is recommended to have some experience in the development and management of websites, before using this tool, and read a lot of information and see videos of its use. It allows to make web sites more flexible and dynamic, despite its lack of facility for non-expert users or developers. "Versatile content management system with the best user community out there"
Drupal can be used for projects of any size -- you can use it to throw together a prototype of a small community site in a weekend, or follow community best practices to create an enterprise information system that serves 10,000+ users. The software make it possible to build almost any system you need, and the community-supported modules typically provide you with 60-80% of the features you need without having to write custom code. The Drupal community, and the community-driven development process, is one of the strongest open source communities you will ever find. The structure provides you with the information and support you need when you need it, while providing a way for you to contribute back whenever it is convenient for you. Often, when you have an issue, you can find a patch that others have contributed for you to get by while an official fix is prepared. While Drupal can make hard things easy, it also has a tendency to make easy things hard. Community-provided Drupal modules often provide you with 60-80% of what you want, but in order to get your project working in a way that fits your requirements (or your customer's requirements), you have to write custom modules or patch bugs on your own. Sometimes to fix something that isn't working, you have to dig into parts of Drupal core or community modules that are terse and difficult to understand long sections of code that need refactoring. Often an issue you need fixed ends up being a known issue for which the community has been debating "the right fix" for several years. If you don't adopt best practices regarding source control, features, patch management, and staying up-to-date with new versions, you can end up creating a project with a lot of technical debt that is difficult to maintain without a large team. Consider whether you just need a blog or single use-case system versus a full-blown information system. Drupal is not a good fit for single-user or single use-case sites because it requires a fair amount of time to setup to work the way you need. WordPress, Shopify, and Strikingly are all good platforms for smaller, simpler sites like those. - Taking the time to get to know the community. - Adopting the recommended best practices for change management, and making extensive use of revision control. - Whenever possible, keeping site structure and logic in code that you can commit to GIT rather than in the database. Content belongs in the database; structure belongs in code. - Never hacking core code or module code, but being ready to adopt a patch management process when you do need to apply short-term patches until a full fix is ready for issues. Drupal provides us with a way to build large, multi-user information systems without having to implement common functionality of user management, content management, or core architecture. It frees us to focus on the business problem at hand rather than on the low level architecture. It also provides well-defined interfaces between modules that ensure that most modules we find out in the community will work with other modules we use or write from scratch. Finally, Drupal provides a wealth of best practices and extension points to allow us to scale up what we build as our user bases scale. "Drupal is easy to use with the templates they have in place." I like how Drupal makes it easy to change the layout on a web page. It has different options for layouts and you can choose the one you want to use. I find this extremely helpful when designing web pages with lots of pictures. I like that Drupal lets you quickly undo changes that have just been made. It lets you see who has last edited a certain page and what time. I also like that Drupal gives you a separate url for pdf's you upload. There is also a help section for when I have a question. I maintain the website of a branch of the environmental center at CU Boulder. Drupal is easy so even students are able to make changes. "An underdog solution with full hidden potential"
Drupal has it all business website, Ecommerce platform, personalization, social network sites, newsletters, resource directories, and many more. It's the most secure system in the market, only if you know what you doing compare to Wordpress. Drupal also has very good international scalability options. We are managing content in 4 different languages and they are seamlessly integrated at one place. From SEO perspective, drupal works like a charm, from load time to crawlability I have yet to encounter any bot issue associated with any search bot. Highly recommended for mid-large business, but always use a good hosting provider which is fully compatible with drupal . Drupal is not fully aligned with all the Saas personalization solution in the market, and very much rely on very specific hosting providers like Acquia. There are some ongoing bugs in configuration like "server host name not valid", usage of multiple template to name couple. It's not easy to manage some common stuff in-house, as you need experience drupal developer to perform technical issues. I would recommend to gather your requirement and create a roadmap, then identify weather Drupal is the right solution for you. If you are in B2B world, drupal has seamless integration with top automation tool and CRM. I don't have any issue with API and scripts as well. Web showcasing, content management, & personalization. From B2B perspective, this is one scalable solution from both sales and marketing side. "Really great and powerful CMS"
Drupal is an extremely powerful CMS and is far less easily hacked than any other platform in the world. From a development standpoint, you have much more access to anything you need than any other CMS's in my experience. There's really nothing Drupal can't do! While Drupal has a ton of customization, it's often times hard to navigate the menu structure to get where you need to go. The thing you want to do doesn't always live in the most obvious place and Drupal uses terms specific to the platform so if you're used to one thing and switch over, it'll take some getting used to. I personally prefer Drupal to any other CMS but it definitely has a learning curve! If you're coming from, say, Wordpress, it'll definitely be a bit of a challenge. I think it's worth it in the end once you're comfortable with it, for the security if nothing else! It's almost never hacked so your information is secure. We built a distribution on Drupal using Pantheon and we are a web development and marketing company. So we use Drupal for all of our website build projects and our own company website. We find that it's just a better platform and we've tailored the features we need (and built) to our industry. "Drupal 8's Rearchitecture is a productivity Win"
With the Drupal 8 upgrade, the workflow of pushing configuration changes from a development server to a QA server and on to production is one of the biggest wins. Each configuration change can be stored in a YML file and checked in to a code repository - no more syncing databases. Great improvements have also been made to the authoring experience for content and block placement. Extending Drupal has gotten modernized - the theme system now uses the powerful and secure Twig templating system, and the extension modules are now controlled using OOP practices like plugins, extending classes, interfaces, traits and default configuration is stored in YML files instead of needing to be custom coded. Performance improvements are also everywhere - Drupal's core now include's Facebook's BigPipe technology for improved caching of content that does not change between page loads, allowing custom content sections to appear as they are generated, meaning the time to first render of the page is greatly improved. If your programmers were used to Drupal 6 or 7 development, there will be a bit of a learning curve - the content admin experience will be incredibly familiar, but the theming and module development has changed quite a bit. Some popular Drupal 7 modules have not yet been ported to version 8, or have been obsoleted by new features in core or other community forces. 90% of what you need should exist, but some industry-specific features may need rearchitecting or paying a developer to port a module. This is not dissimilar from the last major feature upgrade. Websites, Intranets, Product Catalogs, eCommerce, Crowdsourced content, Gamification, Publishing, Learning Management, CRM, Government services, and creating a web interface to applications that have none, or making a search-engine-friendly version of same. "The most flexible site-building tool out there!" Drupal can be almost all things to almost all people. It has nearly unlimited power under the hood, but it's presented in a way that a site builder (or anyone without coding experience) can build a custom site using the community's amazing modules and themes. It's more than a CMS! Drupal is also very easy to extend and write custom modules and themes for yourself. It can be overly complicated. Building a Drupal site can sometimes be daunting and expensive because there is usually a "Drupal" way to do things which involves research and learning, and potentially community support. Give it a try, but don't let initial impressions scare you off if it seems complex. There is a lot to take in, but there is a great community out there able to answer your questions and help you get started, and the payoff is worth the effort! We're building big, complex websites with Drupal that don't fit well into a simpler CMS such as WordPress. We're creating a "product" out of our work on the Drupal platform, allowing us to save time and standardize our development on a particular set of features. We support a large number of community modules as well as our own theme and are using it for every project which it makes sense for. "Powerful - Complex - CMS"
I like that the administrator can have a variety of users with a broad spectrum of capabilities. If I only want a user to change photos or images on a certain page, I can limit them to that and not have to be concerned that they could even touch the original. This CMS is better when it comes to large scale organizations' needs. I like that it can be customized by the user / developer and that it is so powerful. What I dislike - which keeps me from using it anymore - there are limitations to the amount of plugins and themes compared to WordPress. Additionally, the complexity of this CMS provides such a steep learning curve that it is difficult to teach this to university students (and that is my profession). It isn't that themes don't exist, they do - however they are very pricey. If you are considering Drupal, do so only if you have extra time, coding experience, and a good understanding of how CMS' work. I would suggest that you view other sites that have used it and see what you like and/or dislike - then, if possible, contact the web developer and ask some questions that may lead you into using it or not. At least you will have some insight. Providing a website for clients that will allow the client to take over once the development has been completed and accepted. Additionally, it is a CMS to introduce to university students that are unaware of what a CMS is. 1) It's a bit like lego blocks, which makes it very flexible. 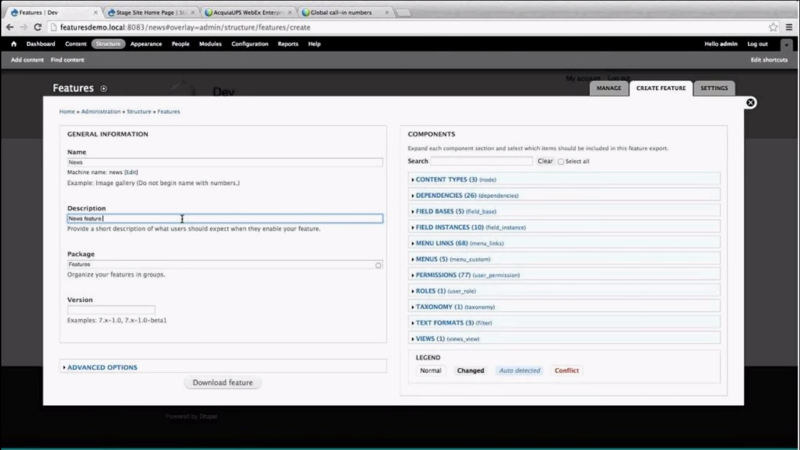 Drupal has a system of "modules" which you can add to your site to create new functions. For example, the Commerce module lets you add shopping functions, the Membership module lets you do member based services, while the Video modules lets you host video clips. Each of these modules are made up of small modules themselves, which ensures you only turn on the bits of the functions you need. Better yet, you can mix and match the modules to produce things the original creators might have never thought of. For example, combine the Commerce, Membership and Video modules and you could create a paid for membership site of training videos. In Drupal, all the system code is in one layer, code to do with appearance (e.g. CSS, HTML) is another layer and custom modifications go in another layer. This makes it very easy to change things. For example, you can change the entire layout of your site without having to modify the original content to adapt to it. Remarkably, the core technology and all these modules are available for free. There are some themes that you have to pay for if you want to change the look of your site, but you can make your own themes and there are number of free themes as well. Drupal has a network of dedicated and helpful users who are willing to provide plenty of free help and support. There's also a good selection of free training videos on YouTube. Drupal releases minor updates on a monthly basis which address any of bugs or security concerns that crop up. There are also major updates every 2-3 years, which radically change the functionality of the core system. Most code can easily be transferred between sites. So if you create a function on one site, you can move it to another without having to re-do it all from scratch. Because Drupal has a module system, you can easily do quite a lot without needing to know how to code. It might not look and function exactly as you want, but it will be a decent effort. The down side of all the flexibility, is that there are often 10 ways to do one thing in Drupal and it's not always clear which method is best. Often the only way you can find out is through experience. Which means your early Drupal projects might not be as good as they could be, as you cut your teeth on learning which methods are best for you. 2) Your code won’t last forever. Every 2-3 years, Drupal releases a new major update which radically changes the functionality of the site. The plus side of this is that it makes Drupal better. The downside is that you will often have to completely re-write your custom code. Because these major updates change everything, you will often need to install new modules to replace old ones. Essentially you have to rebuild your site (thankfully all the content can be transferred over). Upgrading isn't a requirement. But after a couple of years, the older versions of Drupal are no longer supported. So if building a Drupal site, expect to replace it in 3-5 years. If you are need to turn around a project quickly and for a low price, Drupal is the perfect choice. It does have a steep learning curve but once you learn how to use it, you will save hours of time in the long run. A membership website people where can book appointments for swimming lessons with their children. After they have taken the lesson, the web site will let them download a video of their session. When they complete all the lessons, the web site will let them access a certifcate. An design agency website which contains a catalogue of products and servcies. All of these projects contain advance features. Producing these manually would have been very expensive and cost lost of time. But with Druapl, I was able to turn around the projects quickly and for a low cost. I would have to say that one of my favorite things about Drupal is the ability to creative so many different permission levels. Having various users with access to the back end of our site, it has been amazing to be able restrict access that some users do not need. It has helped keep our content organized and consistent from page to page when users aren't able to create a page for a single paragraph or change the fonts and colors to something different from our brand. The interface isn't drag and drop like other CMS. There is a bit of training involved when we first get users set up. Since our site was built with a custom theme, it is more difficult to make changes and updates to the site. We have to reach out to our developers to do that on the back end using GitHub. It would be nice, and faster, if I was able to do that myself. We also run into compatibility issues with some modules. We are not running on the most current version of Drupal so we've discovered that some developers have now turned their focus on modules for the current version so when we make updates to our version, some modules are no longer compatible with the version of Drupal we're running on. Do your research throughly before you choose a CMS. Understand its strengths and weaknesses fully. We thought we could build our Drupal site on our own, with just a couple novice and some Lynda tutorials. That's definitely not the case. Luckily, we were able to find an amazing company with Drupal experts who could help us get our site up and running. We never would have been able to without them. If you can find a wiz Drupal developer, I highly recommend it. It could be costly, but it will pay off in the end. We have used Drupal to create one cohesive, more simplified site. With various permission we can restrict the amount of access people have to create pages and content willy nilly. We have also created a workflow within Drupal that requires admin approval for all content to ensure everything is the highest quality and most professional before being published. We love that any feature we dream up for the site, our Developers can help us build it. It's entirely customizable. "Drupal - An "everything you need" publishing platform"
Drupal is easy to integrate with others, it can be used to publish your blog, or you entire company´s website. The integration piece allows you to use the same platform with your customer service, or it can be used to authenticate your visitor´s on a hotspot page. There is a initial learning curve and also you need to pay attention to the updates. And Drupal will tell you that there are updates. So after you finish your install, configure it correctly and keep it updated. Spend some time practing before going live, it´s a whole new world! You can use Drupal to keep your documentation ready and searchable, you can also use it as an Intranet Portal, CRM or any other platform. "An Easy to Use CMS for the Non Technical "
Relatively easy interface, lots of information about how to use Drupal is available on line, lots of additional user group add-ons are available because of the number of user groups currently active. Drupal is not necessarily know for being cutting edge software, so some developers might turn up their nose at using it. I would definitely recommend Drupal, for both its ease of use and stability. Because the software is so popular, there are a number of developers creating APIs, and user groups area available if a user needs help using the software. We needed a content management system that would be relatively easy to support on the back-end, and easy to use, on the front-end, by non technical people. Drupal does help solve this problem. "The system for beginners and pros alike"
I think Drupal is easy to work with as a unexperienced user who has nearly no knowledge but can also used to build nearly everything for a professional worker. There are uncountable designs, modules and so on from various members of the community that you can use even without having perfect knowledge about them and how they work. We had some issues with the newest version of Drupal but after some time we were experienced enough to go on with it. Recommended for everyone because the tool is so flexible that you can build with it what you want. And the fact that it is open-source (free to use) has to be mentioned, everyone can test it for themselves. Mainly it is used to manage page contents for our company website. "SImpler than i thought at first"
The simplicity offered is astounding and this product is a great competition to other content management system in the market. I urge users to try it out. "It Does What It Needs To"
We are able to manage five different websites on one CMS. It is not very user friendly. The interface is not easy to navigate, the image upload process is confusing, and it is not very intuitive. Additionally, the editing tools are subpar compared to other CMS systems I have used. If you decide to use Drupal, I would recommend having an in house expert, because odds are you are going to need someone to build custom functions for you. We aren't using Drupal to do anything out of the ordinary. We use it to host web content for a variety of elearning sites. I have found that it is extremely easy to edit meta tags. "Good, but not for large scale"
I love this platform for building high end marketing sites, built by developers for developers, the architecture of the code and how things get extended with modules is top notch. There isn't a very good way to deploy code through dev -> prod. Since the code and database can be quite coupled, this makes it very hard to make changes after you are live. Great for marketing sites but don't build an app that needs constant changes. We solve the problem of delivering a high quality website with a great CMS behind it. The tool is ideal for those without experience in the design of HTML or advanced websites. Drupal will have an excellent API that, once it is learned, will help them develop in a way that takes advantage of many Drupal features that they would otherwise have to build, other open source CMS options come with many built-in assumptions about how the tool will be used or deployed. Drupal is finally flexible as a web development platform. Drupal has a handful of content workflow modules, calendar, a versatile ACL that you can define and a system configuration that, if you're ready for the task, allows you to define much of it on your own. Drupal does come with a rather intimidating learning curve. Another problem with Drupal is that when it comes to continuous delivery, things get a bit muddy. The complexity increases as more and more developers participate in the project. Very good cms, it is integrated with a wide variety of software - platforms. It has a lot of customization capacity. We have used Drupal to build your internal training portal and manage your sales force. "Needed tool in marketing agency"
Easy for everyone to work on and collaborate with. Easy to distribute content, organize pages, and keep everything as organized to your liking. This product is what you make it. It's hard to think of what there's not to like about a software that does exactly what it should and nothing more or less. I would maybe have to argue about the design/layout of some of the functions/menu. It can be a little odd at times. Great for ease of use, and for clients who have large amount of content/products that need a reliable platform for their company webpage. Almost all big-time, large content websites at my old marketing agency were created with Drupal. As a graphic designer, it was easy for me to log in, and add/edit content that I needed to. I have limited knowledge of HTML and CSS, but it was super easy for me to use and navigate. "User friendly even for non-web developers"
You'll be able to use Drupal as long as you know basic HTML and understand the back end of a website. We migrated from DNN and it’s a world of difference. DNN is extremely buggy and difficult both on the back end and for website visitors. So it’s a huge improvement in comparison to that. I like that it’s easy to find pages and content (though this is more of a theme-specific note). Their media/file uploading method is awful. I really hope it’ll get fixed and become more intuitive soon. We can also add security to a test site, to ensure we don’t have unauthorized users accessing content before it’s ready for the public. We’re on the latest version – 8.0 – and it’s got a few bugs and missing functionality. Even simple things like pop-ups are difficult to implement with our Drupal theme. Media and file uploads are more complex than they should be. Wish it was easy to update and replace files. I heard it’s an upcoming fix, though. The modules are not foolproof and completely user-friendly. If switching from DNN, switch immediately! Drupal has a huge amount of advantages over DNN. When we used DNN, pages frequently broke, disappeared or bugged out. Thankfully, Drupal is much more reliable. We can also revert pages, etc. if requirements change. The overall business benefit is an easier-to-use website for users – internal and external. It’s less frustrating and time-consuming to update our website. I can see us being able to train non-web-savvy team members to do simple updates as needed, if they need the flexibility of immediate updates. "Best CMS available for free"
-Very Awesome features available in this cms in core like Views, services, rest api, hul, etc. -Its 8 version is awesome because of oops. nothing till now which i dislike as there was no oops concept in drupal 7 but its latest version i.e drupal 8 had removed all its negative points, i would say must use it. Best CMS to use in opensource. We made LMS, corporate sites, intranet protals, company website usning this cms. Would say this is solution for every data-modeling problem because it has very awesome db structure and tables view. "Drupal provides a back-end framework for websites, blogs, Use Drupal for website content management "
Very Easy to use with simple steps to set up web pages . Also very convenient to allow team members to edit and update pages by themselves. Features include user account registration and maintenance, menu management, RSS feeds, taxonomy, page layout customization, and system administration. "A powerful CMS for advanced users"
Drupal was one of the first content management systems and is probably the most powerful. Along with Wordpress and Joomla is among the most popular CMS system still. * Flexibility: there are many modules available to extend your website, but if there isn't one ready, you can write your own or extend an existing module. * A great community for support. the Drupal forums are active and you can post questions or problems you encounter over there, and mostly you get a quick reply from another Drupal user. * Security is a top concern, the developers had security in mind while creating the system and they release a quick fix for any security issue found. * performance improved in the latest versions. can handle large sites and can scale as your site grows. Getting started may take some time, and in many cases you are better off writing your own module than using a ready made one. I recommend Drupal to developers. none-technical users should use a more user friendly CMS such as Wordpress for simple sites or Joomla for more adanced sites. There is also the option to use services like Acquia which distribute a version of Drupal they maintain which is good for Drupal beginners. I've used Drupal for creating full websites that includes users management and e-commerce but also it is great for a quick mock-up website with full functionality in order to show a proof of concept to a potential client.